When I saw this dress I was pretty surprised that I loved it. Reason 3: I HATE HOODS…get the picture? Isabel Marant has completely changed my mind on this one. Created with silk, this piece has luxurious day to evening glam. Paired with sandals in the day and colourful wedges during the evening…I think it would be perfect addition to an experimental wardrobe. 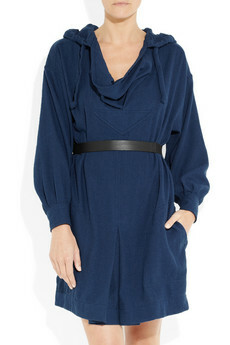 Isabel Marant Cajou Hooded Woven Raw Silk Dress available from Net-A-Porter for £300…wait, no….it’s on sale? now £120! Not at Net a porter , not anywhere .